Holnek Game and Nature Reserve is situated on the road to the Swaziland between Warburton and Lochiel, some 2 hours 30 minutes from Johannesburg. It lies on the escarpment, with its wide vistas and spectacular scenery. It offers a wide variety of activities for the nature lover. Holnek offers the visitor three accommodation options, including a luxury tented camp. The two A-frame chalets, "Pioneer" and "Waterfall", each sleep a maximum of 10 people per night. They are both fully equipped, and the visitor need only to bring food and a swimming towel for the stay. A thatched lapa, with a fireplace fit for a big campfire, accompanies each chalet. Wood is provided on a daily basis. A cleaning service can be arranged at extra charge. The chalets are both equipped with gas stoves in the kitchen, solar power and a gas fridge. linen and cutlery, pots and pans are provided. Both chalets have a splash pool where the visitor can cool off after a day's hiking or on the 4x4 trail. The tented camp, "Wildebos", is on the 4x4 trail and boasts three tents, with an outside kitchen and braai area. The bathroom and shower facilities are comfortable. 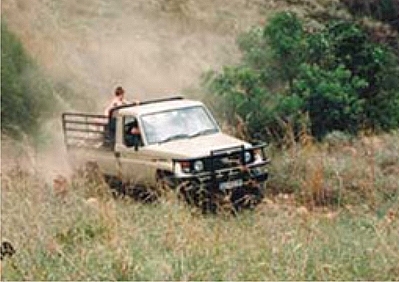 This is the ideal venue for the 4x4 lover, with its own challenging trail. Anglers have the opportunity to go for bass, Florida Bass and Carp in three dams on the property. More than 18 species of game, including black wildebeest, kudu, gemsbok, zebra, blesbuck, springbuck, grey reedbuck, mountain reedbuck, eland, hartebeest, waterbuck and many other smaller species. The reserve also has a large number of bird species, of which 86 are listed. The valleys and ridges of the escarpment provide many exhilarating vistas over the Lowveld. These same valleys and gulleys test the 4x4 driver's skills to the limit. Manda on 082 807 1054 or 017 845 1054 or or Linda on 082 929 5410 or 017 847 2039.